In my house we eat a lot of tortillas, and I mean a lot. It never occurred to me that it would be easy to make my own but I just got the new River Cottage Everyday Cookbook in the mail and there they were, flour tortillas from scratch. It sounded so easy and the picture was so appealing that I couldn’t resist whipping up a batch for our Sunday supper. I highly recommend this book, it’s beautifully photographed and the stories that go along with recipes really inspires me to continue my quest to learn to make things from scratch and grow my own food. 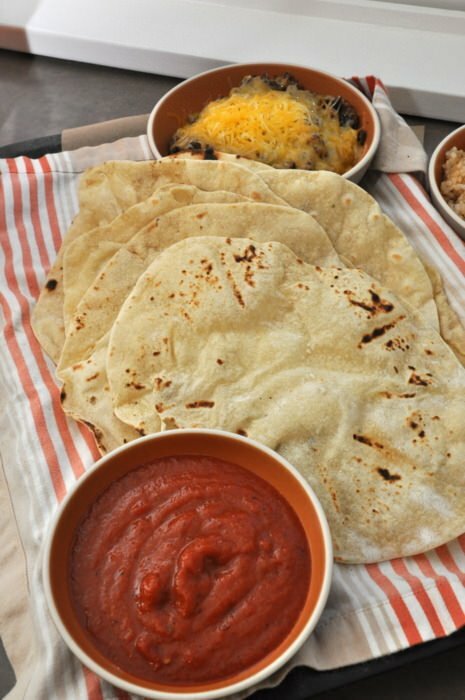 These tortillas are super simple to throw together, just 4 ingredients and a little bit of patience required. The biggest challenge is rolling them thin enough before you throw them on a hot griddle. 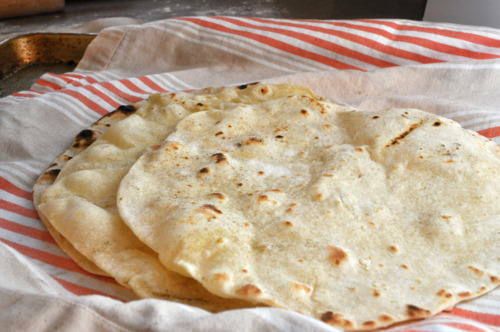 The other thing that really appealed to me about this recipe is that traditionally tortillas are made with LARD, yes that’s right, delicious, fattening LARD and these call for just one tablespoon of olive oil. I tend to eat more corn tortillas because they are lower in fat or calories but I do love the chewy doughy pleasure of a flour tortilla. I do believe that taking the time to make things from scratch not only tastes better but allows you to eliminate all the weird preservatives and ingredients that you can’t pronounce on the back of those packages. 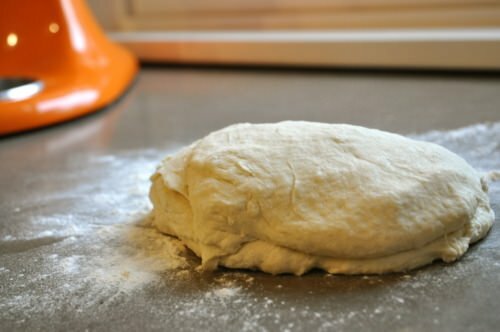 After you make the dough and let it rest for 20 minutes or so you divide it into 8 pieces and let them rest again for 15 minutes so that they are easy to roll out. TIP: do not skip the second resting period or you will have a devil of a time getting them thin enough. There we go, nice and thin, just the way tortillas should be. Ready for a nice hot skillet. Ninety seconds later and presto! Delicious hot tender tortillas. Now go stuff them with something delicious and enjoy! We loaded ours with some pork tenderloin and homemade chipotle salsa. These don’t keep like the ones you buy in the supermarket but are so worth it. 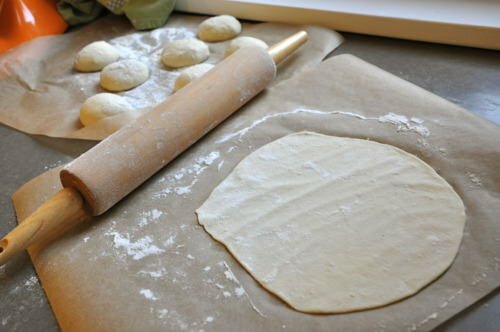 You could roll them out and freeze them between parchment and then are only a few minutes away from fresh tortillas any day of the week. What a great idea, I think I might go whip up a batch for the freezer right now! Sift together flour, salt and baking powder in a bowl. In a separate container pour the olive oil into the warm water and then slowly add the water to the flour mixture, stir with a fork until a dough forms. 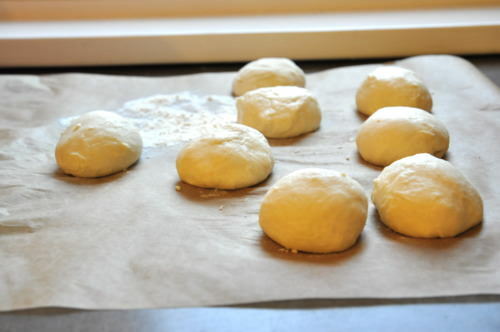 Cut dough into 8 equal pieces and form into balls, let rest for 15 minutes to let it relax and make it easy to roll out. Cook the tortillas one at a time for 45 seconds on one side and then flip over and cook in the same way on the other side. Transfer to a kitchen towel to keep them warm while you finish the rest.